The Montreal City Hall is an elegant building situated in Old Montreal (Vieux Montreal). 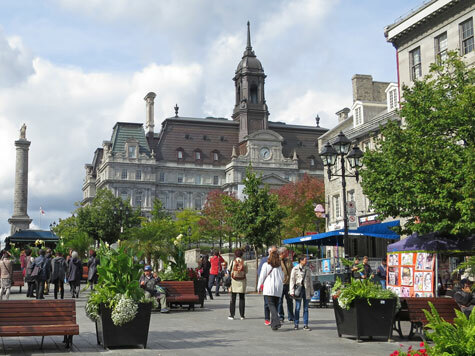 Completed in 1878, the building is located across the street from Place Jacques Cartier. The architectural style of the City Hall is called French Empire Style. In 1967, president General Charles de Gaulle of France uttered the controversial words "Vive le Quebec libre!" (Long Live Free Quebec) from the balcony of the city hall. In light of the fact that thousands of Canadian troops had lost their lives helping to free France from German occupation during WW2, De Gaulle's divisive words were not well received by most Canadians (and most Quebecers). Unhappy that the president of France would attempt to interfere in Canada's internal affairs, the prime minister of Canada at the time (Lester B. Pearson) responded that "Canadians do not need to be liberated". Visitors to the Montreal City Hall can visit the impressive Hall of Honour. Tours of the City Hall are also available.